Most of us try to get organised, especially as the new year starts, but day-to-day tasks often take over and our processes become even more chaotic. However, now’s as good a time as any to make some changes around your home. It’s time for The Big Tidy. To help you get on top of the tidying, we’ve put together some important dos and don’ts which will help you get things sorted quickly and efficiently. We’ll also recommend a number of cleaning and tidying products along the way so your decluttering tasks are done in next to no time. Before you start, put together a to-do list of all the areas you want to tidy up. This will help you work through everything methodically and you’ll also feel a sense of triumph as you tick off every room as it gets sorted. Before you start rifling through all of your belongings, it’s a good idea to start with the spaces where all of your boxed items are going to be put. This includes store cupboards, understairs storage spaces and attics. Giving them a quick tidy means you can put boxes from other rooms straight in without having to shuffle anything around. It’s also worth putting some hooks up, especially in garages and sheds, and hang whatever you can (e.g. 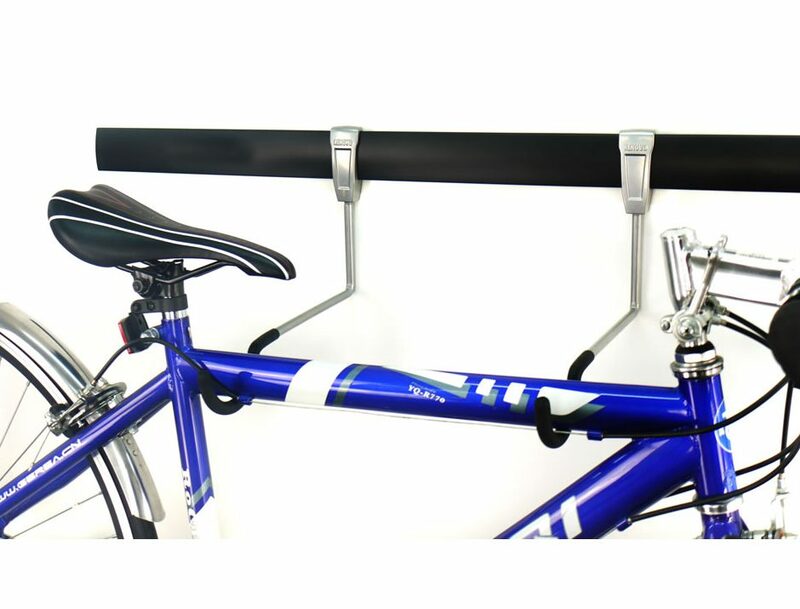 bikes) to create more storage space on the floor for heavy, bulky items. Whether it’s food items (e.g. tins of beans and sauces) or shirts (e.g. different colours, seasons or occasions) try to put things together so they’re easier to access. While you’re sorting through everything, look to see if there are any duplicates. This will stop you buying anything you don’t need, reducing the risk of future clutter. 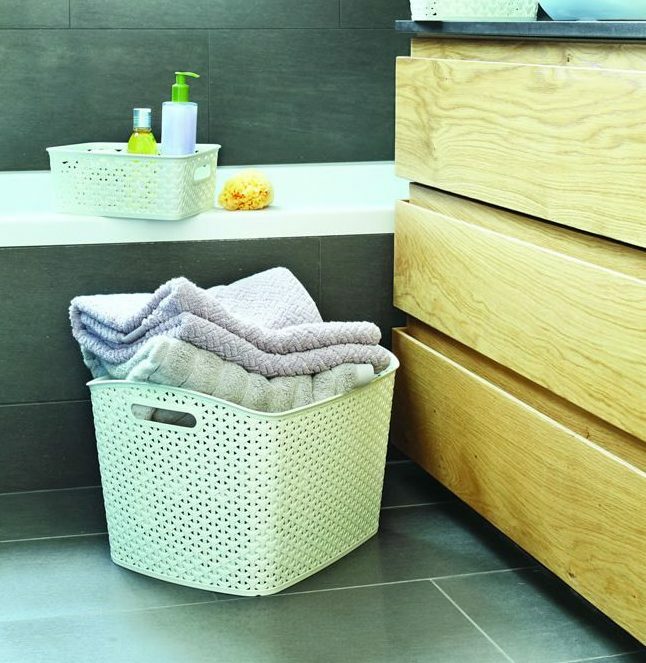 As tempting as it may be to arm yourself with an assortment of storage boxes, try to organise all of your stuff first. That way you’ll know how many storage boxes you need and what size they need to be. It’s also a good idea to make sure these boxes are going to fit where you want to put them, i.e. under the bed, in the wardrobe or under the stairs. Nothing’s worse than going out and buying a heap of containers to find that there are lots of empty ones just adding to the clutter around your home. You may have loads of cardboard boxes left over from when you moved house, but try to avoid using them unless you need to store lightweight items away (e.g. clothes). Robust plastic storage boxes are far more practical and won’t get bashed around as you move them from place to place. Equally, when your storage boxes are going to be on display, why not choose something which complements your interior space? 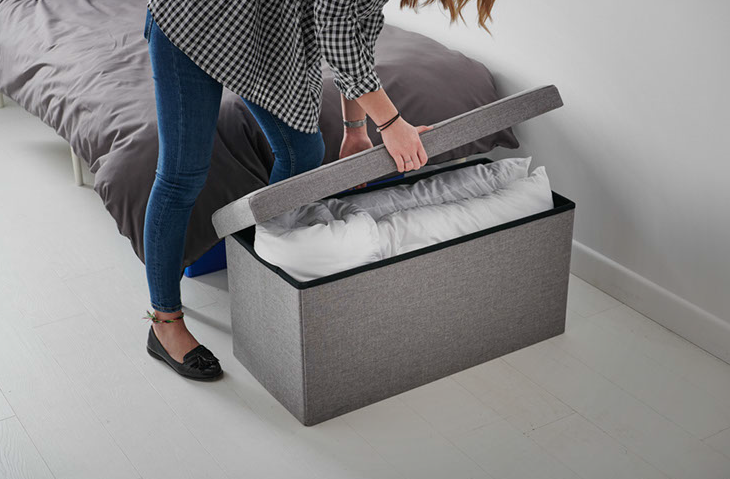 We think ottomans and blanket boxes are ideal for creating extra seating and storage space, while baskets look great with magazines and other accessories in. These are often the messiest cupboards , but you don’t have to leave them like that. Instead, categorise all of the items in these cupboards so they’re easy to find. For example, have a tool section with all of the essentials (e.g. screwdrivers, hammers, spirit levels), a light bulb box, hooks and other accessories in sub-sections of your drawers/cupboards. This will make it easy to find things quickly and will also make it far easier for you to keep these spaces tidy in the future. Even if you wake up one day full of enthusiasm for tidying your home – don’t just set aside one day to do the entire house. Spending over 8 hours organising is everyone’s worst nightmare and as the day drags on it’s highly likely you’ll become less efficient and more frustrated. Instead, try to set aside a couple of hours here and there to organise one room or part of the garden. This will make you feel much more on top of your chores without being overwhelmed by taming the rest of the chaos all over the house. Clear out any outdoor buildings so you can start again with your storage. 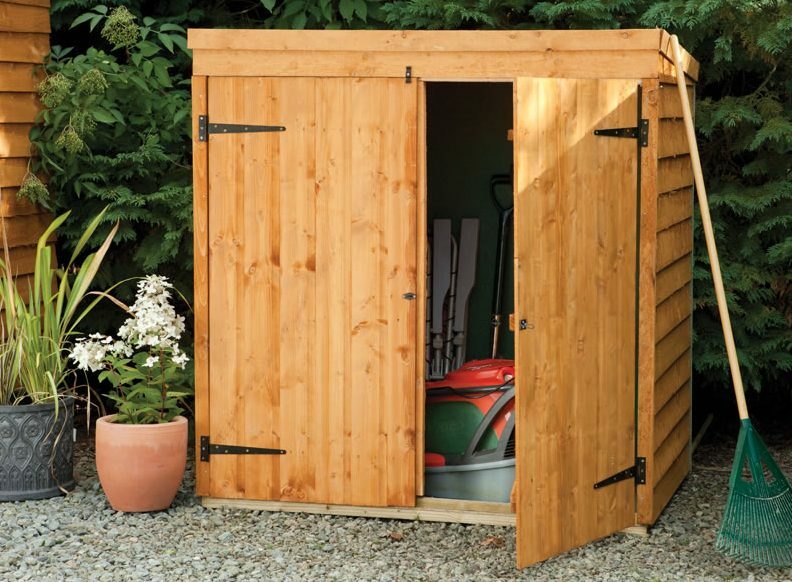 Remove any clutter and debris (this may take a couple of trips to the local tip) before putting anything else in garden storage and labelling it up. Give your shed a lick of paint (if it needs it) and replace any broken glass in your greenhouse. This will prepare them for all weathers and help improve the overall look of your garden, plus it’ll keep the stuff inside safe and secure. Toys strewn all over the garden can be a bit of an eyesore, so try to store them away in the shed or garage when they’re not in use. Get rid of any toys that your children don’t play with anymore. You could even sell them online or at the front of your house to make some extra cash (to buy more storage boxes with!). Although you do need to break The Big Tidy down into manageable chunks, you also need to carry it through to the bitter end. For example, after you’ve sorted through your wardrobe and thrown out old, unworn clothes, make sure you get rid of the clothes straight away. You could donate some to charity, give some to friends or recycle threadbare items, but don’t just pile the bags up in your garage to sort out another day. By doing this, you’ll only be moving the clutter from one room to another. Put the bags in your car and arrange to drop them off throughout the week. So you cleaned and tidied until your home was clutter-free, immaculate and unbelievably tidy – but now, a month later, the clutter has started to creep back in. Have faith in your new, organised system and try to continue your new-found habits each and every day. It’s easy to forget about tidying when your home’s decluttered, but it’s easy for the stuff to start piling up again if you’re not careful. Try to take time out each week to sort things out, store things away and get rid of anything you’re not going to use. That way, you won’t be faced with a massive tidy up ever again! When you’re putting things in boxes, make sure you’re labelling everything up properly. This will make it much easier to find things, so if you’re looking for something, you won’t need to go rooting around for it in all of the boxes you have around your home. 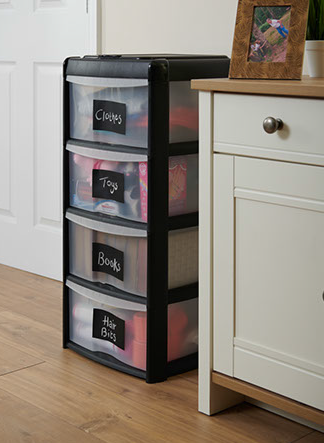 Tidying hack – Add a square of chalkboard sticky back plastic to storage boxes or drawers as a simple and stylish way to label them. And it’s so easy to change the labels the next time you have a clear out. Simply wipe the chalk off with a damp cloth and start again. As you can see, taking part in The Big Tidy doesn’t need to be a boring job. It gives you chance to get rid of that clutter once and for all! Shop our full range of storage boxes online.